Furry friends can wreck havoc on your floors. When you get a do-over (or start from scratch), select one of these top flooring options to spare yourself unsightly scratches, dents, and dirt. Q: I’m considering a complete overhaul of the floors in my home, but I’ll need something that stands up over time to wear and tear from two pets. 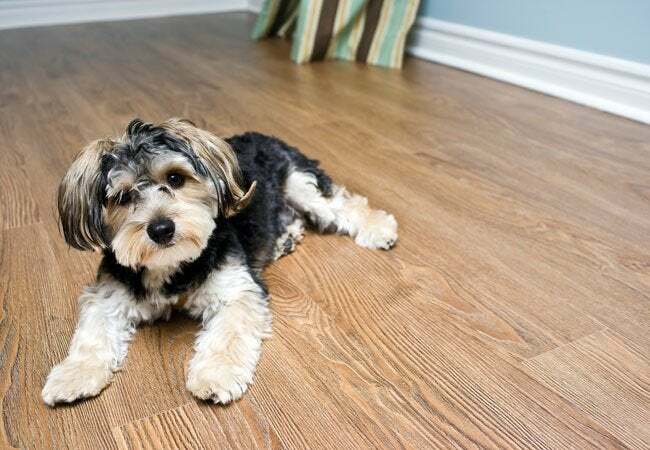 What’s the best flooring for dogs? A: There’s no doubt about it: Dogs and cats make great companions. But while pet owners enjoy having their four-legged friend around the house, the pitter-patter of furry feet takes a toll on your flooring. That’s why pet owners should consider installing floors that stand up to dents, scratches, and dirt over time. Of course, the best flooring for dogs and other pets will vary by type of animal and personal taste, but here are the pros and cons of five popular options. Stone, tile, and concrete are durable yet uncomfortable. Hard flooring options such as stone, tile, and concrete are most likely to withstand the constant wear and tear of clawed feet. These hard surfaces are also the easiest to clean after a wet dog does its trademark shake, a long-haired cat sheds its fur, or an untrained pup leaves behind a messy surprise. As a downside, flooring made of stone, tile, or concrete can get chilly during cold weather, and dogs may be uncomfortable relaxing on the hard surfaces. Both issues, though, can be addressed easily by scattering thick rugs and pet beds throughout your home. As an alternative solution, some homeowners may choose to install heated floorboards. Laminate flooring stands up against pet messes but has little traction. An excellent choice for easy cleanup, laminate floors offer the beauty of hardwood with less maintenance. Homeowners won’t need to worry about letting moisture linger for too long on the surface, which is ideal for those with accident-prone or water-loving pets. Additionally, the durable surface of laminate resists scratches and scuffs. Laminate flooring’s only disadvantage is its slippery sleekness; fast-moving dogs may end up skidding across the room and hurting themselves. Consider choosing a laminate with a textured surface to provide more traction for Fido. Luxury vinyl has many advantages for pet owners. Nowadays, many manufacturers produce luxury vinyl planks that look remarkably similar to laminate or hardwood. The affordable option offers easy cleanup, high comfort for four-legged friends, resistance to scratches and stains, and minimal noise when walking across the surface. The single downside of luxury vinyl planks is that they may dull easily. Always make sure to choose flooring with a thick top layer and an aluminum oxide coating to ensure longevity and durability. Stick with certain varieties of hardwood. Although hardwood floors are beautiful and classic, not all types hold up well in households with pets. Moisture can warp and destroy wood floors, making it critical to clean up pet-related messes immediately after they occur. Even so, some stains may absorb into the floor, necessitating costly refinishing or replacement. Hardwood floors also scratch easily; paws, pet toys, and water bowls can leave an ugly scuff mark on the surface. If you’re determined to incorporate hardwood floors into your home, opt for the hardest varieties, such maple, Brazilian walnut, and bamboo. Just remember to keep those claws trimmed and clear away messes ASAP. Avoid carpeted flooring with pets. 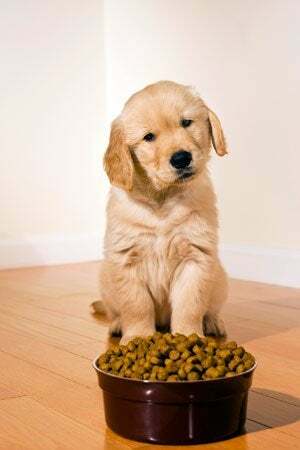 Easily the toughest type of flooring for pet owners to clean, carpet bears the burden of potty-training accidents, excessive shedding, and other messes. Carpet also harbors odors and stains that slowly build up over time, eventually causing your carpet to look and smell bad. The negatives of carpet will most likely outweigh the only positive: Pets love the comfortably soft surface. If you must choose a carpeted floor, opt one without loops (which snag on animal nails) and invest in a high-quality vacuum cleaner.